Our Spanish document photo service is 100% compliant with the requirements. Our photo studio is located in Orlando, FL. 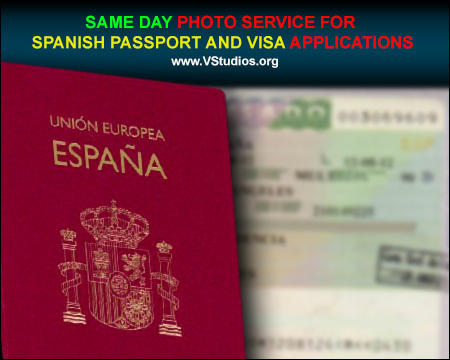 We provide a guaranteed no rejects Spanish passport & visa photo service. 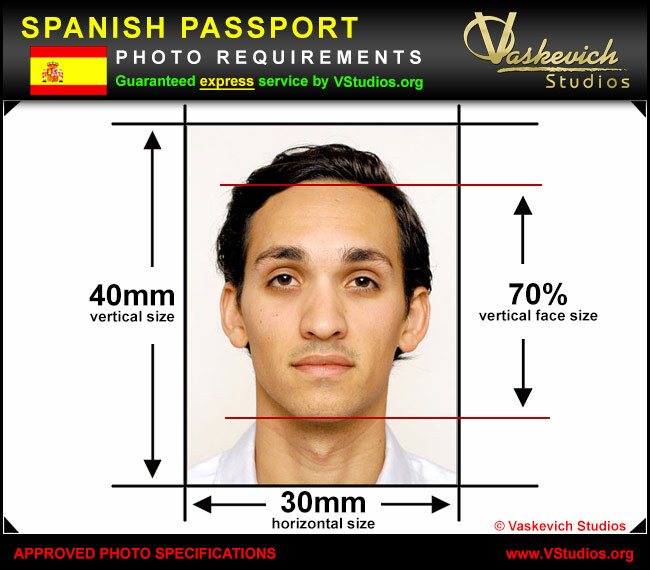 The requirements for passport photos are provided for those living in the United States by Consulate of Spain in Miami. For same day photo studio appointments email or call our Orlando Orange County location at (407) 610-2451 for same-day service availability. NO REJECTS! We make photos that comply with exact specifications provided by Consulate of Spain and are updated by Spanish Consulate for exact specification required to provide passport & visa photo service in Orlando, FL. (!) Consulate of Spain in US suggests not to use non-professional photo services in Mail and Package stores, Pharmacies and other places that provide photo services as these photographs are rejected during the application process due to non-compliance. When applications are rejected due to invalid pictures, the application process must be restarted from beginning which significantly delays processing of travel or immigration applications. Our photo studio offers Same-day professional photo service. Spanish passport photos and visa pictures are printed within 10 to 20 minutes. You will receive two (2) identical and unaltered original professionally taken and printed passport photos with correct and verified biometric face measurements, photo size, and background. We utilize enhanced digital technology to make natural looking photos. All photographs are taken in-studio by a professional photographer. Please wear a solid-colored top/shirt to ensure a proper contrast with the photo background specifications. Do not wear white tops. If you need to wear prescription glasses, only non-tinted glass is allowed. To schedule an appointment for Spain Passport or Visa Photo services email or call our Orlando Orange County location at (407) 610-2451 for same-day service availability. We offer competitive prices for Spanish Visa & Passport Photo Services and have been providing photo printing services for Consulate General of Spain since 2003. Note that specifications for Spanish visa and passport pictures are different. Passport photograph must be 40mm by 30mm with applicable biometrical measurements. 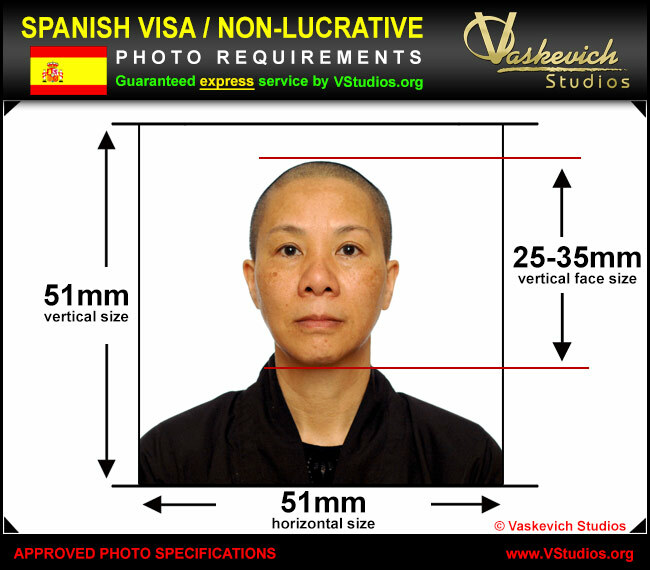 Visa photographs must be 2x2in (51mmx51mm) with white background. Refer to the photo requirements below towards the bottom of the page. The head and top of the shoulders must take maximum of 80% of the dimension of the photograph. The skin colors must appear natural and not over or underexposed. For guaranteed acceptance Spanish Visa and Passport Photo service email or call our Orlando Orange County location at (407) 610-2451 for same-day service availability. The services we provide are in full compliance with the requirements of Consulate General of Spain and we guarantee acceptance of your photographs. All photographs are taken by appointment only. Please call us first before visiting our studio to ensure a fast service. Since we provide same-day passport and visa picture service and can make immediate same-day appointments.